Actor Steven Bauer is the sort of down-to-earth guy who’s willing to come right out and tell an interviewer that, overall, his career in Hollywood has been “kind of… a little iffy,” so it really does the heart good to see him currently experiencing a bit of an upswing in his success. If you’re a fan of “Breaking Bad” – and, really, why wouldn’t you be? 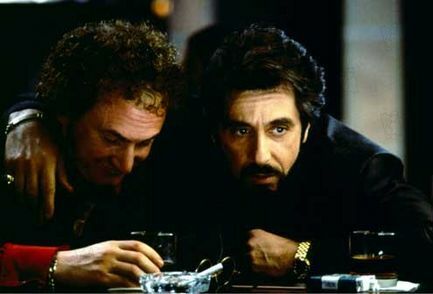 – then you saw him make the first of his two appearances on the show this season, and the timing couldn’t be more perfect: between those episodes lies the Blu-ray release of “Scarface,” where Bauer ably held his own against Al Pacino with his performance as Tony Montana’s brother from another mother, Manny Ribero. Although we only had a short time to talk, Bullz-Eye still managed to get Bauer’s recollections of working on both of these projects. Check out a sample of our chat with him below and then head over to Bullz-Eye for the full interview. Bullz-Eye: With “Scarface,” my understanding is that it was a combination of your very authentic Cuban background and your audition that helped you get the part. How did you prepare for the audition? 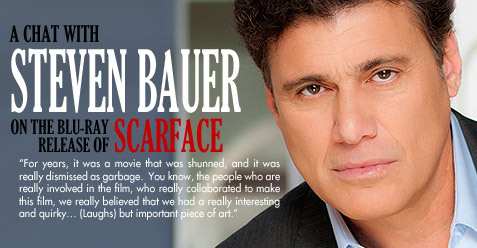 Steven Bauer: Wow, it was… I’ll tell you what: it was pretty daunting at the time. What I did was… y’know, I read the script, I knew the script and I understood it, knowing that I had very little in common with this character of Manny. Fortunately, I’d met guys like that, so I had something to draw upon. Because I’m the antithesis of Manny. Well, I was then. I probably became more and more like Manny as I got older. (Laughs) But at 24 years old, I was more like Justin Bieber than Manny Ribera! But I had seen those guys, y’know, growing up in Miami. I’d seen guys who were that way, and that’s really what I drew upon. Also, it was the sensibilities of the Cuban who has lost his homeland and is really sort of adrift in the world and looking for any harbor. Landing in the United States is the opportunity to do anything you want to do and be anything you want to be. BE: Talking about your inherent Cuban-ness, did it ever give you pause at all that so many non-Cuban actors were selected to play Cubans in the film? SB: Not at all. Will, honestly, it was an amazing coming together of actors, and I for one… well, first of all, who am I to judge? (Laughs) But secondly, there was no room for judgment, because the actors that they chose, beginning with Bob Loggia as Frank Lopez. He did his own work, he did his own research, and he came up with a totally original Cuban character that… I recognized him immediately. He’s that guy who laughs at his own jokes. He’s a big blowhard, y’know? It was a fantastic character that he created. And then Murray Abraham created that weasel of a man, Omar. And the other guys who weren’t Cuban, the guy who played the Bolivian – God rest his soul, Paul Shenar, who passed away years ago – he was fantastic. And he had no knowledge of any Bolivian. But he did tremendous research. And when you look at the whole canvas of the actors that were chosen, they’re all stars. They’re all beautiful, amazing artists. Michelle Pfeiffer, in her second film role ever, she created this beautiful, beautiful character, this haunted girl who’s just completely lost and attached to this power, to this man, and then attaches himself to the other man as soon as he gets the power. And again, the actors who were playing Cubans, they were all… the ones who were playing the important roles in the film, they all did amazing, amazing work. I always, always defend it. According to /Film, word has it that “127 hours” contains a solid hour of screentime without dialogue. If Danny Boyle doe his job right, I’m guessing even the most gleeful gorehound, might be taken aback by the crucial sequences in this film. In case you haven’t guessed already, it’s based on the real-life experiences of mountain climber Aron Ralston, played here by James Franco, who faced the ultimate survival challenge and won — but at the cost of having to remove his own arm. Audiences who have no problem seeing people torn apart by bullets at the movies regularly squirm when we see an onscreen blood test or an actor playing a junkie pretending to shoot up. How will they react to a closer to real-time self-amputation? How will Boyle — not a particularly squeamish director by any means — deal with it? And what about my squeamish self? The MPAA R rating is for “language and some disturbing violent content/bloody images” which sounds relatively restrained and about par for the course, but who knows? Will anybody want to see this? Assuming it’s well received, what about the Oscar people? I have no idea how people will react to this one. 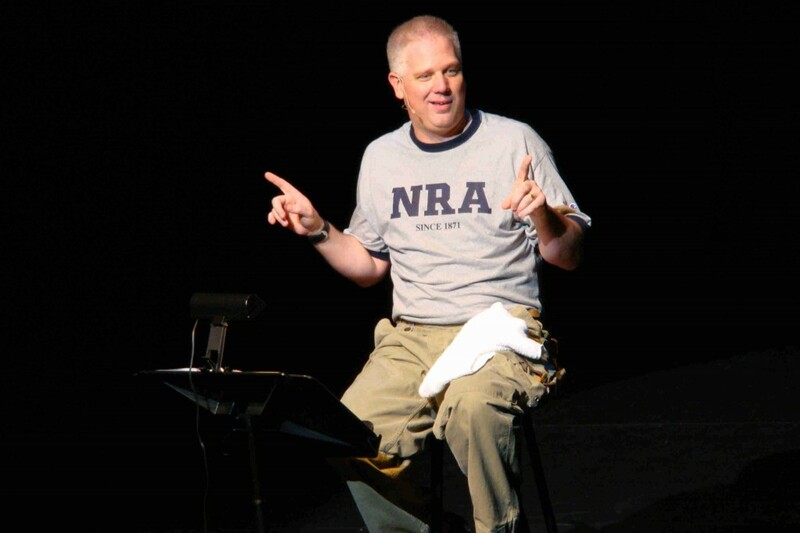 * In a massive example of what this liberal feels falls under the category of “dude, I’m not sure you’re helping,” while talking to the press, James Cameron launched into a somewhat humourous expletive filled tirade against Glenn Beck, the newest and by far the looniest resident of the Fox News asylum. Naturally, this was grist for the mill of John Nolte over at Andrew Breitbart’s frequently even more unhinged far right film blog, Big Hollywood. Now, it would probably take me the aforementioned five thousands words to explain why the vast majority of what Nolte ordinarily writes is, I believe objectively and factually, complete horse puckey. However, here there is a definite kernel of truth in noting that Cameron’s decision to release an initially stripped down “Avatar” single disc with zero extras on Earth Day, naturally to be followed by more deluxe editions in the future, doesn’t exactly fit in with the environmentalist message of the film or Cameron’s claims to be not too terribly concerned with making scads of money. Though, to be fair, Fox — owned by Rupert Murdoch — does have something to say here as well. Of course, Glenn Beck has responded and, watching said response, during the first half I was thinking: “Good work, James Cameron, you’ve given Glen f–king Beck a chance to look sane.” But, fortunately for my view of the universe, Beck’s need to over-dramatize, even in an attempt at humor, prevented him from looking too stable or stable at all. Steven Zeitchik of the oh-so-liberal (in comparison to Big Hollywood) L.A. Times provides the video and some context involving Cameron’s involvement in a 2007 documentary touching on the historical reality of the New Testament. 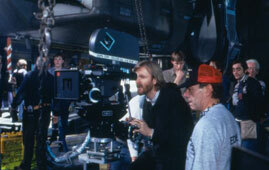 Big Hollywood provides the same video and some very different context on the same film. I simply don’t have the time to investigate that one right now. Three things I’m sure of, however: 1. One of these men is a gifted egomaniac; 2. the other is a former “Morning Zoo” shock jock who has found the only job on the planet requiring even less intelligence and sense of responsibility; 3. the best way to turn the public off the entire issue of the environment is for James Cameron and Glenn Beck to have a debate about it. I haven’t been paying quite as much attention to the cinephile end of the movie blogosphere as I should lately, so we’ll start there. * It’s never too late to check out the Brian DePalma blogathon that wrapped up yesterday at Tony Dayoub’s Cinema Viewfinder. I’m actually not a member of the DePalma cult that includes everyone from the late uber-critic Pauline Kael to Quentin Tarantino and probably 70% of the male cinephile population. I dig a few of his movies a great deal and the oddball horror/suspense musical satire, “Phantom of the Paradise” has a special place in my heart. On the other hand, I have serious problems with even some of his most well-regarded films including, or perhaps especially, especially “Blow-Out.” There’s a cheapness to his films and tendency to wallow in despair that I can’t support. Of course, that’s just me and Dayoub wrapped up yesterday in grand style with a fairly personal piece about “Scarface” (vastly overrated by many; I’ll take the Howard Hawks “Scarface” over it any day) and “Carlito’s Way” (which I think is underrated and overall just a solidly good movie). Anyhow, stroll around the site and you’ll see pieces by some of the true superstars of cinephilia. * Speaking of great film lovers, you won’t find detailed appreciations of DePalma coming from The Self-Styled Siren — nor of Michael Mann or Sam Peckinpah. Her bailiwick is classic era films (ending roughly around 1965) with an eye towards melodrama and comedy. Though her identity remains a secret, her fans are legion and definitely includes your humble host. Her latest post is an attention grabber: “Ten Melos the Siren Would Watch Instead of Mad Men” which is exactly what it sounds like. It’s a fascinating list that males who want to expand their minds beyond the usual guy movie obsessions should definitely contemplate. And, yes, there’s a vigorous debate over “Mad Men” in comments, as well as an unsolicited cocktail recipe from me. If you’ve been looking for the inevitable backlash over the acclaimed series, which I personally love as much as anyone, there’ll be no more enjoyable place to find it. Some news after the flip….